I have chosen to boycott the Olympics this year. Am I wrong in doing this? I will be the first to admit that haven’t read ALL the news on everything regarding the games and Tibet (over the years), however I feel I have a good sense of what’s going on. 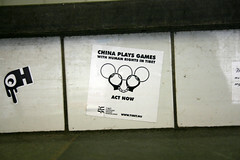 Having been a gymnast and swimmer for many years, and my husband being a gymnast as well, the Olympics are a staple tv must do for our family…however, me also being an AI supporter for many years, I have to do what I can to protest China’s actions (all the different types). Should I be supporting the athletes or standing up for human rights… I feel the latter, no offense to the athletes, are more important, because it has enabled them to get to where they are today.